Marsha Lowe interviews artist, art historian and curator Eddie Chambers. Eddie Chambers work is featured in No Colour Bar: Black British Art in Action 1960 - 1990. Marsha Lowe M.A. is a Director of Realism Ltd. a communications consultancy working with the voluntary sector. She studied Arts Policy and Management at The University of London focusing on the issues facing black artists working in contemporary Britain. As a columnist for SABLE Litmag, she continues to write on a variety of topics concerning the enduring global impact of colonialism on contemporary society. ML: I’d like to begin with Joseph Johnson[i] from your book, Black Artists in British Art, which documents the history of Black artists in this country. I wonder if you could speak a bit about how you feel we're progressing with the task of reinserting ourselves into history? Documenting that people like Johnson existed, had an impact, were part of the infrastructure and the importance of us knowing that for ourselves? EC: What I would say about Joseph Johnson and that wider history that you just touched upon is I think that raising awareness is an ongoing project. There has been, relatively speaking, a fairly large amount of scholarship researching Black British history so I think that the challenge is making that known to a wider public. There hasn’t been that much in relation to the visual arts although the wider histories are now fairly substantially documented but somehow that material has not yet made its way into a wider consciousness; it exists in its own space. Some publications have come into existence recently, wonderful new material such as the Oxford Companion to Black British History but they need to be more widely known. ML: Yes, and we’re talking today because of the new art exhibition being held by the Huntley Archives and, now that the Black Cultural Archives are in their new home in Brixton, I wonder what role they might have in terms of trying to disseminate this knowledge to a wider audience? EC: It’s probably too early to say for definite what contribution the Black Cultural Archives might make but I’m hoping that it will become an established fixture. I’m hoping that one of the contributions it might make is to attract schools, not only in Lambeth or London but across the country. It should be a destination in the same way as the V&A might be or the British Museum; I think it has the potential to make those kinds of contributions. Because once that history can enmesh itself within the school curricula, there’s much more chance of it being normalised and accepted as being part and parcel of British history. I’d love to see schoolchildren from all across the country, of all backgrounds, being taught and learning about the wonderful richness of history including, of course, its black dimensions. One thing I should also say is that the issue of archiving and collecting material is such a fragile enterprise because it’s very time consuming and it’s very costly to collect material, to assemble it and also to make it available to the wider public. There have been many projects that have come and gone for the want of resources. So this is a major issue because, within Britain, funding is such a major issue. So something can come into existence, it can operate for a couple of years and then it can whither for the want of more funding. 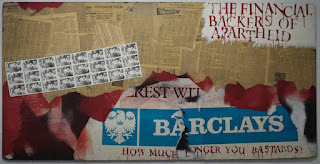 How Much Longer You Bastards, 1983, mixed media on board, Museums Sheffield (on loan to No Colour Bar) © Eddie Chambers, 2012. ML: And the lack of that type of sustained support is also an issue for many of the artists featured in your book; I was impressed by their sheer resilience during much of the time you document. EC: Yes, absolutely. I think in some ways one of the strongest eras of Black artists’ activity was around the early 60s. But we’re talking about quite sporadic exposure. Frank Bowling was probably one of the most energetic and active artists and by 1963-64 he found his career stymied somewhat and his work not being accepted for a couple of important exhibitions. So this thing about one step forward and two steps back, it’s been a feature because we can roll that forward to the 80s where we have a period of astonishing activity in many respects with lots of exhibitions happening around the country but where are those artists now? Several of them are still around but a great number of them have essentially disappeared. So when one hears about exposure for an artist at the present time, it’s quite tempting to wonder how long this exposure will last. Because there is a pattern of certain artists being allowed to have some exposure but that can very rapidly become an historical thing. ML: I did get the sense when I read your chapter on some of the more prominent Black British artists working today that you felt some doubt as to whether this signalled lasting change. EC: Yes, and I think it’s too early to say. In some ways the omens for the favoured few are quite good, particularly if one looks internationally. Chris Ofili[ii] recently had a very successful retrospective at the New Museum in New York and just this week Hew Locke[iii] received quite a lot of press coverage for his commissioned work to commemorate the 800th anniversary of the Magna Carta. He was born in Edinburgh and raised in Guyana and here he is, an artist selected for quite a major commission. I think the work was unveiled in the presence of the Queen and the Prime Minister, and so on. And so if you’re minded to respect those types of initiatives, then in some ways they can be seen as quite important pointers to some artists at least having a sustained success. [i] Joseph Johnson was an African seaman in the Merchant Navy century until he was injured and subsequently discharged. Ineligible for assistance because he was not British, he took to busking on the streets of London, where he was drawn with an intricate model of the ship Nelson on his cap in 1815, thus potentially becoming the first Black British visual and performance artist. [ii] Chris Ofili’s Night and Day retrospective was on exhibit at the New Museum in New York from October 2014 to February 2015. [iii] Hew Locke’s The Jurors is a permanent artwork that stands at Runnymede and was unveiled by Prince William on 15 June 2015.